With all the excitement of E3 we are focusing our attention on an announcement trailer for FTC. Dubbed, Announcement Trailer #1, it will act as an introduction to FTC's story and give a sense of the atmosphere and feeling of FTC. The trailer will be out early next week, look forward to it. This week I've spent a great deal of time working on cinematics and learning about post processing and lighting effects. A lot of research and camera work was done to get the feel we were going for. 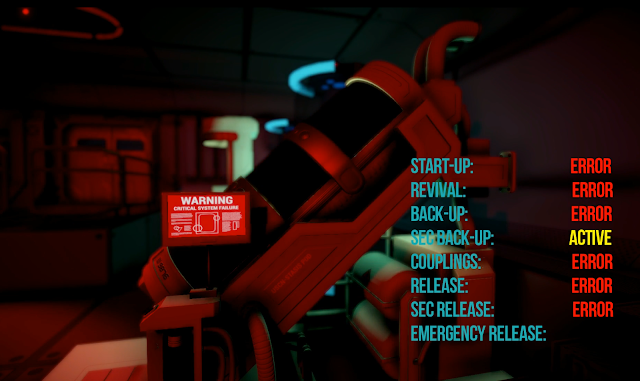 Inspired by the Alien film introduction sequences we were going for a creepy vibe. Hopefully the end result is a good enough announcement trailer. The next one we make should show off a lot more of the beauty of FTC. Next week I'm delving into the combat module of FTC and starting to create a small tutorial for testing and prototyping. The tutorial might even be the main basis of a pre-alpha for public testing but unsure of whether that will happen at this stage. As for my thoughts on E3 this week, I was impressed by a couple of the game presentations. I'm certainly looking forward to Dragon Ball Fighters Z as I'm a huge dragon ball fan boy. I'm very optimistic about Monster Hunter World as the monster hunter franchise have been among my favourite JRPG's that I've had to the pleasure to play. Battlefront 2 looks absolutely stellar and I'm hoping that DICE can fix the issues they had from the first game. Metro Exodus another game that I'm really excited for as the first two metro games were also really amazing in their story telling and game play. Lastly everything that Nintendo has shown off at E3 has been amazing! I'm loving the direction they're taking as more of a software company and not a hardware company. Collaborating with Microsoft and Ubisoft shows they're evolving. Of course I'm really excited for the core pokemon RPG announced and looking forward to Metroid Prime 4!! This week I put the finishing touches on the tutorial script, started mock-ups for the character generation system, started work on the art for the tutorial and spent a considerable amount of time working on the announcement trailer #1. There is a great deal of back-end stuff that needs to be done for every aspect of FTC's gameplay, aesthetics, look and feel. Everything in the game needs a reason to exist, an origin, a convention and a name. You can't rip this stuff from somewhere else, because it doesn't exist. I use history and my personal experience in the Navy as a starting point, but many things require extensive research and prototyping before it is ready to be included in the official canon of the game. Take the image above for example. I designed these uniforms by using a variety of sources for inspiration. The black undershirt is from the Royal Navy/Military around the world, so you can take off the jacket/overshirt for sweaty work. The jacket is a mix between Star Trek and Battlestar Galactica. 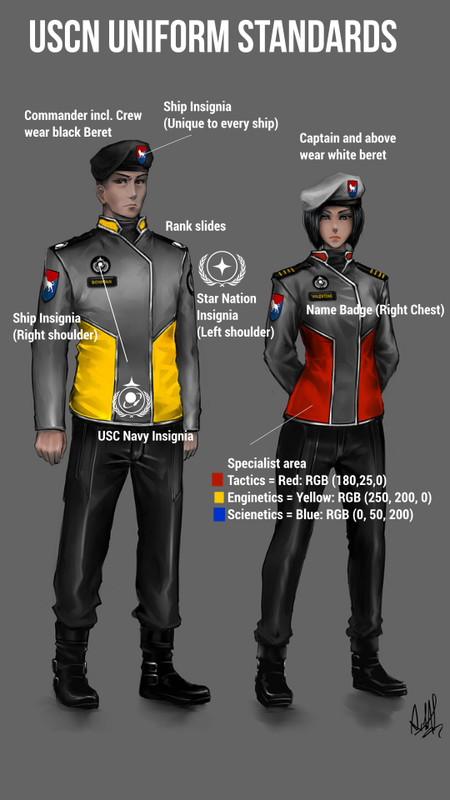 The insignia placement is directly from the Royal Navy and the berets are from Honorverse. I even had a jacket like this made by a seamstress to test its practicality. That is how focused I am on attention to detail. Everything in FTC needs to be believable and consistent within the universe's rules. This is what I think makes good games - attention to detail. Grades are important in FTC. Ranking up grants new grades, which grant new ship types and fleet compositions. Realistically, an Ensign would never take fleet command of a fleet, but in history Ensigns/Midshipmen (junior officers) have taken command of ships in times of emergency. The grades are also apparent on the player's character as they rank up, so it is another example of attention to detail. I've also started work on a character creation system that should be able to generate portraits of a variety of characters that look quite unique, but retain that 2D art feel. 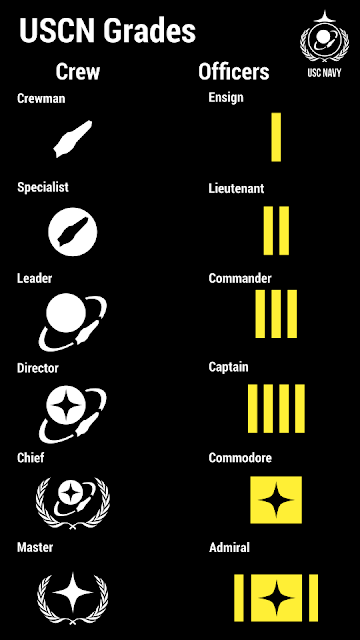 This will also be used to generate Officer Abilities. The visuals for the announcement trailer have been completed and are just waiting for the music and sound to get done. I was really impressed when we finished the visuals. It looks great in my opinion. I hope you enjoy it. Finally, E3... was terrible. What happened to gaming? All these AAA developers with mountains of money to burn and all everyone makes are 3D slideshows with cinematics. Nothing really caught my eye, it was the same games from last year and the year before that. Another Assassins Creed? Why? Another COD in WW2 no less? Have we come full circle? That's the issue with big developers and publishers. Once they go big they lose all sense of creativity, because they have so many resources they no longer need to innovate. The top is stagnant in my opinion. That is all for this week, look forward to a new video next week and hopefully some gameplay at the end of the month.